Mexican Drug Cartel Kingpin Captured In Joint U.S.-Mexico Raid : The Two-Way Joaquin "El Chapo" Guzman, the head of Mexico's Sinaloa cartel, was arrested in the Pacific coastal city of Mazatlan, according to officials. Joaquin "El Chapo" Guzman is escorted to a helicopter in handcuffs by Mexican navy marines at a navy hanger in Mexico City on Saturday. A senior U.S. law enforcement official said that Guzman, the head of Mexico's Sinaloa Cartel, was captured alive overnight in the beach resort town of Mazatlan. This story was updated at 4:20 p.m. ET. The head of Mexico's Sinaloa drug cartel, Joaquin "El Chapo" Guzman, was captured overnight by U.S. and Mexican officials in the Pacific coastal town of Mazatlan. The Associated Press first broke the story, quoting an unnamed "senior U.S. law enforcement official." NPR's Carrie Johnson has confirmed the arrest. "Guzman faces multiple federal drug trafficking indictments in the U.S. and is on the Drug Enforcement Administration's most-wanted list. His drug empire stretches throughout North America and reaches as far away as Europe and Australia. His cartel has been heavily involved in the bloody drug war that has torn through parts of Mexico for the last several years." Carrie spoke to a law enforcement source who said that Guzman was captured at a resort. "The discovery of a complex of tunnels under various residences helped authorities nab Guzman," she says, whose source says "no shots were fired in the capture." "Few details were available on Saturday morning, but a picture of Mr. Guzmán, who appeared to be handcuffed and with a few cuts to his face and torso, circulated among law enforcement officials. So hidden was he that there was uncertainty what he looked like, but American officials believe they have the right man. Mexican marines captured him in the Pacific beach resort area of Mazatlan. ... In the past year, several of his top associates had been detained and crime analysts who follow the drug world had speculated his days were increasingly numbered." 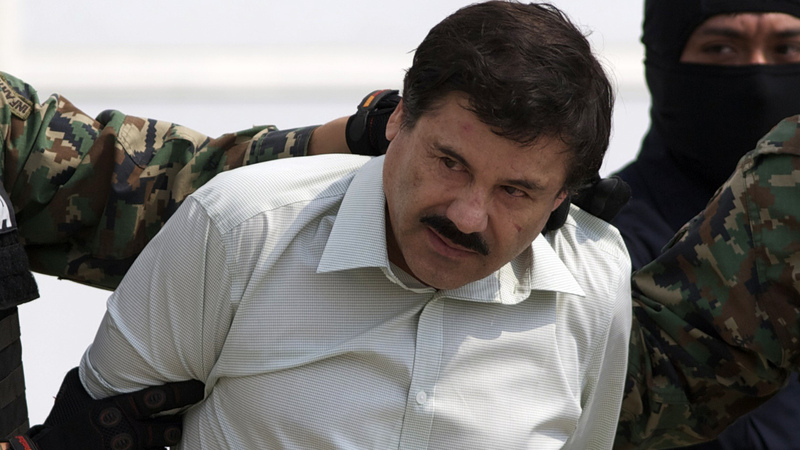 In a 2012 story in the Times, Guzman was described as "the world's most powerful drug trafficker." "Guzmán's organization is responsible for as much as half of the illegal narcotics imported into the United States from Mexico each year; he may well be the most-wanted criminal in this post-Bin Laden world." It's not the first time that authorities had gotten close to Guzman. In 2012, NPR's Melisa Goh reported that the Mexican Navy had had to backtrack after announcing that the drug kingpin's son, Jesus Alfredo Guzman Salazar, had been captured, only to realize later they had gotten the wrong man. The Drug Enforcement Agency and FBI have "high confidence" that they got Guzman this time though, Carrie says. "To give you a sense of El Chapo's reach and longevity, he has been charged in eight different U.S. districts," she says, adding that there's no word on possible extradition. Later, Guzman was taken to the capital, Mexico City, where he was paraded in front of the media at a navy hangar, before boarded a helicopter surrounded by armed troops. AP quotes Attorney General Jesus Murillo Karam as saying Guzman was taken directly to prison.